While he was cooking, my father was an intense maestro, focusing on getting dinner on the table every night after work. “Outta MY kitchen,” he’d say, waving a spatula or a ladle or a chef’s knife at those who dared to offer help or peer over his shoulder as he was peeling and chopping and sautéing. A heavenly dish for Dad. The kitchen was his domain. Our garden was his market. The milkman (yup, I’m THAT old) supplied milk, butter, cottage cheese and the meat locker supplied a side o’ beef for the double-wide chest freezer in the garage. We kids acted as his crew when it came to planting and harvesting and cleaning and preserving the strawberries, raspberries, peas, sweet peppers, cucumbers, green beans, tomatoes, corn and potatoes. 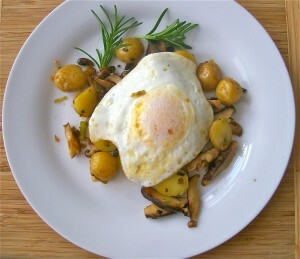 And so, in honor of my dad for Father’s Day, I created a nouveau hash this morning. I used baby new potatoes, something that would appall my dad. He always told us to leave the baby potatoes on the ground when we stooped to pluck them from the ground. “Throw those things away. They’re too small,” he’d say. What were you thinking, Dad? No recipe here. It’s a make-it-up-as-you-go kinda dish. 1. Cook baby potatoes until just tender. (I simmered them in salted water, altho I sometimes roast or even microwave ’em.) In the meantime, sautee thinly sliced leeks and garlic scapes in olive oil. (or use chopped onion and a clove of chopped garlic. Add sliced shiitake mushrooms and baby ‘bellas. Cook and stir until mushrooms are tender. 2. Drain potatoes, cut the bigger babies in half. Toss ’em in the skillet with the mushroom concoction. Add a tablespoon or two of butter or additional olive oil, if needed. Sprinkle with a good seasoning. Maybe salt and pepper. I use Gray Sea Salt w/ Five Pepper Blend from ile de Re France. Add some chopped fresh rosemary (or whatever herb you have handy). Toss and stir for about 5 minutes to combine flavors. 3. Cook an over-easy egg (or two or three depending on who’s invited for breakfast). Put potato hash on plate(s). Top with the cooked egg(s). Add fork(s). Thanks Tony! Eating good food is a legacy I am doing my best to uphold, which is why I’m sweating with Jillian Michaels whenever I can!